Photograph This! 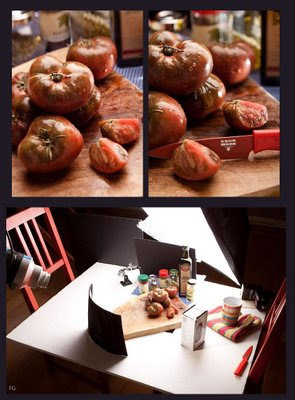 : I say Tomato, you say Product Photography. I say Tomato, you say Product Photography. I am a big fan of the Strobist blog. It's one of my favorite sources of info on equipment, techniques and up and coming commercial photographers. OK enough gushing. The neat thing is the assignments. They are usually commercially themed, clearly explained, you submit your image to Flickr and there you go. You end up staring at a few hundred awesome images from photographers all over the world, including a lot of pros. You might even win a prize.